This is a fall card for Joan's Gardens Thursday Challenge #12.... make a card or project this week and use the following: Striped paper, Pearls or Brads, Piercing and a Stamped Fall Image; preferably (but not required) a JustRite Stamp. 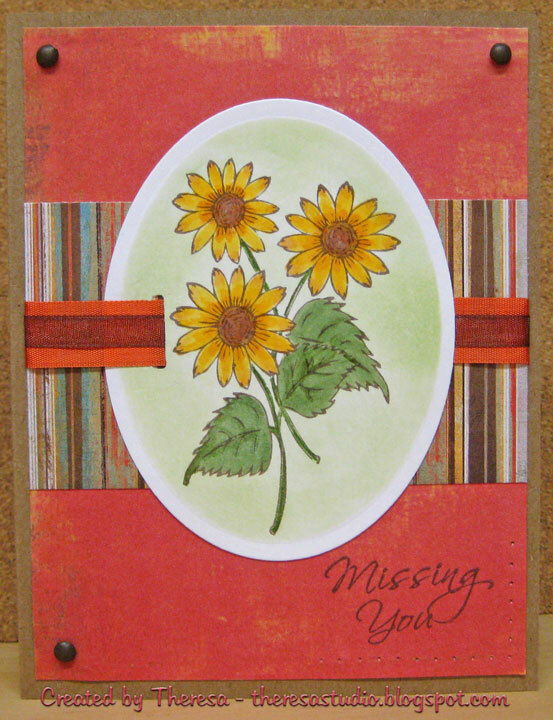 I used the fall stamp of sunflowers from GKD "Signs of Autumn" which I stamped with Memento Rich Cocoa, colored with Copics, cut out with nesties oval, and sponged with Memento New Sprout while the oval was in the die. I used a base card of Kraft CS, a mat and strip of Basic Grey from "Max and Whiskers" paper pad. Added orange ribbon with another ribbon of brown organza and finished with brown brads and paper piercing in the corners. Sentiment is a GKD stamp. I believe I covered all the bases. Used a sketch from Paperplay Challenges but did not enter because the link was closed....got mixed up the time zone. I think I will also enter at Mark's Finest Papers for Speedy the Cat's Friends Challenge #18 to make a friendship card. Don't you just hate it when you miss the deadlines... totally bums me out when I do that! Love your card! It's a winner in my eyes! Theresa, Beautiful card! I love how your flowers pull out the colors in the DP. Great job! Thanks so much for playing in Joan's Gardens #12 weekly challenge. It is so much fun seeing all the beautiful cards! Sorry you missed the deadline! I do that all the time! Your card is fabulous! I love this gorgeous card!! What beautiful work!! Thank you so much for sharing it in the Friends of Speedy the Cat's friendship card challenge!! Lovely coloring on your pretty flowers! Thanks for playing with Speedy's Friends! What a beautiful bouquet!! Your coloring is really fabulous. This is a beautiful card...are you sure you missed the deadline? It should be considered!